Rock Bass by Warwick re-emerged in 2009 with a newly designed, and upgraded feature set to match their German counterparts. The entire range of Rock Bass instruments now feature the Warwick 2 Piece Bridge. 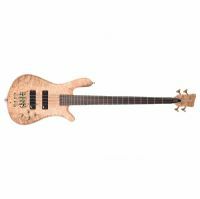 Warwick RockBass Star Bass 4-String Passive Electronics Solid Creme White High Polish. 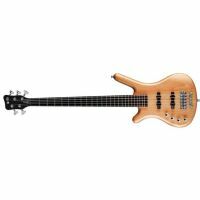 The Warwick R594 850CR RockBass StarBass Electric Bass features a semi-hollow maple body coupled with a maple neck and Rosewood fingerboard to produce a bright, warm tone with sizzling highs and firm lows. The Streamer Stage II features an elegantly contoured body made of African Afzelia wood. It has an arched top and an ergonomically recessed back. The slim neck-through design - invisible from the front - is recessed into the body.